It caught me by surprise to see Tavern Pub & Restaurant on groupon! 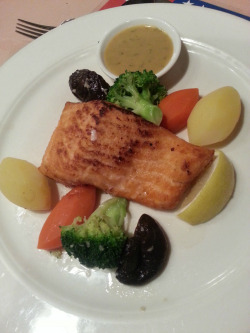 Since I had a wonderful lunch during my last visit and we love this place alot, without much hesitation I bought a "$29.90 for 3-Course Fine Dining Set Lunch at The Tavern Pub & Restaurant (Worth $80). " for two person. It's a steal as the original lunch meal set costs $60.00 for each person. Here's my hearty and savoury 3 courses meal x 2. 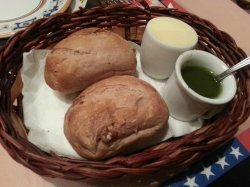 Hot breads were served while waiting for our main courses. Comes with a frozen butter/margarine and olive oil. The Choice of appetizer are Greenland Shrimps 'Calypso' with Crunchy Green Mango OR Soup of the Day and we have both. 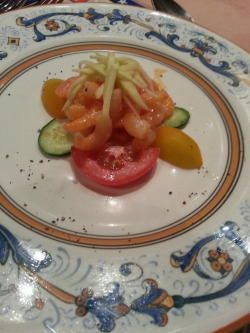 A little bit spicy wasabi taste like prawns paired with cherry tomatoes, slices of big tomatoes, cucumbers and some mangoes over it. It's awesome as a start! 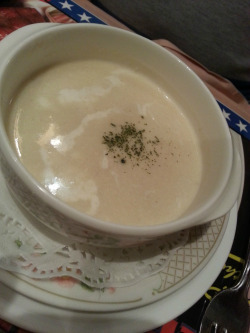 Soup of the day is cauliflower soup. It tastes light, not too creamy and too vegetable and definitely suits our liking. 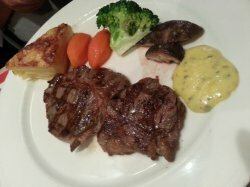 and we have chosen the Ribeye steak and Salmon Fillet. My portion of panfried Norwegian salmon fillet was well done. It is definitely worth waiting for! The taste and crisp at the outer layer tastes just alright and with the right amount of sweet lemon sauce adds ,my meal was make so complete. Choice of beef is medium done as requested. This piece of ribeye was well cooked - tender and chewy. There is no issues cutting the meat apart with little force. Meat was juicy and taste are even. Simply divine! Crepe Normade is savoury. Diced tart apples were tuck in between the crepe. 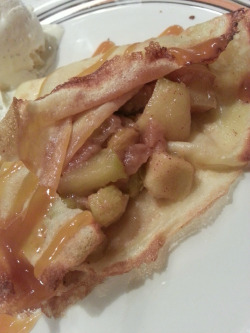 Also the crepe is covered with some lines of caramel designed by the chef. 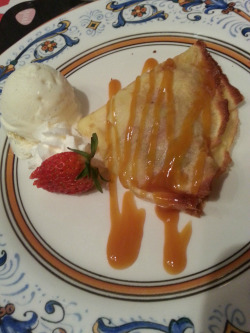 The chocolate chip vanilla ice cream makes a perfect combination together with the crepe. 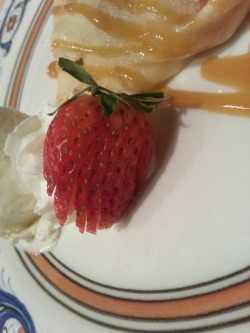 Even the lovely strawberry was designed,cut nicely and placed nicely at the side of the plate. 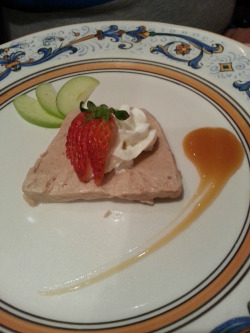 The Chestnut Parfait looks like strawberry over a piece of luncheon meat. Taste is light and not overpowering. Tea and coffee as dessert. Their tea and coffee tastes different. 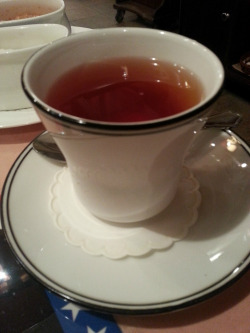 Besides the usual little cup of condense milk a restaurant to pair with the hot beverages.They also provide sugars cubes which were rarely seen in most restaurant nowadays. Reservation were made easy via phone call with no hiccups. The waiter were smartly dressed in suits. What impressed me most is that even we have dine in at special rates, our service was not discounted. They are still as professional as the good normal days. Great romantic meals under the warmly lit lightings in a gorgeous restaurant styled like a cosy European dining room. Since this is a groupon deal, it's a steal and it will be a very good chance who wants to do fine dinning at half the original price. Reservations to be make before dinning.